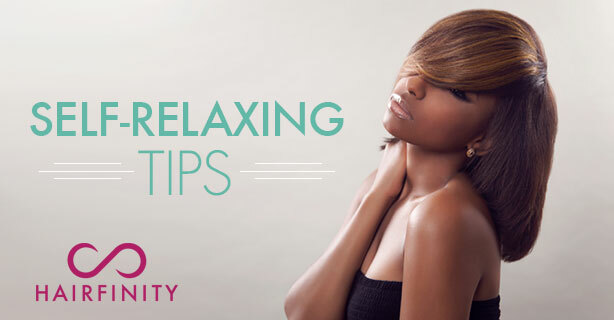 Doing your own relaxers at home can save you time and money, as long as you don’t make costly mistakes. It’s very important to apply chemicals correctly and to follow directions so that you don’t wind up with damage to your hair or scalp. These self-relaxing tips will help you get professional results. Have all tools on hand: In addition to the contents of your relaxer kit, you’ll also need a timer, a comb, one or two mirrors and a couple of old towels. Gather all your materials before you begin, and make sure everything is within reach. Base your scalp: To prevent chemical burns, take the time to apply a base (such as petroleum jelly) all around your hairline and the parts in your scalp. Work in small sections: To ensure even coverage, work on areas about one to two inches wide. Trying to apply relaxer chemicals to big chunks of hair will result in unevenly straightened locks. Use plastic clips to hold sections that you’re not currently working on out of the way. Enlist a friend: You may find it easy to relax the front and top of your head, but have trouble with the back. Mirrors help, but a friend or family member is even better. Work quickly: You’re on a time limit when relaxing, so you need to work carefully, but quickly. Once the chemicals are applied, spend your remaining time smoothing with your fingers. Rinse thoroughly: Before adding the neutralizing shampoo, rinse as much of the relaxer away as possible. Lukewarm water is better than hot, as it won’t irritate your scalp. The more relaxer you rinse away first, the less you’ll have to neutralize. Lather often: Leaving any traces of relaxer in your hair leads to overprocessing. Your hair may thin or break. It’s crucial to neutralize thoroughly with the provided shampoo. If you don’t think you’ll have enough, buy a backup container from a beauty supply store. Following these tips will help you get the smooth finish you want without damage. HAIRFINITY is transforming the hair of women all over the world with a unique blend of vitamins, nutrients, and our exclusive Capilsana™ Complex. Users of Hairfinity have reported improved manageability and overall appearance.